Visitors enjoying iris flowers from a tea house at the famed Kamata Iris Garden (蒲田菖蒲園, Kamata Shoubuen) in Kamata, Ota-ku (大田区), Tokyo. Early 20th century. The iris garden, measuring about 8 acres (± 3.3 hectare or 一万坪), was located close to Kamata’s Ayamebashi bridge (あやめ橋) and Kamata Primary School (区立蒲田小学校). Opened in 1902 (Meiji 35), the garden attracted so many people that Kamata got its own train station. 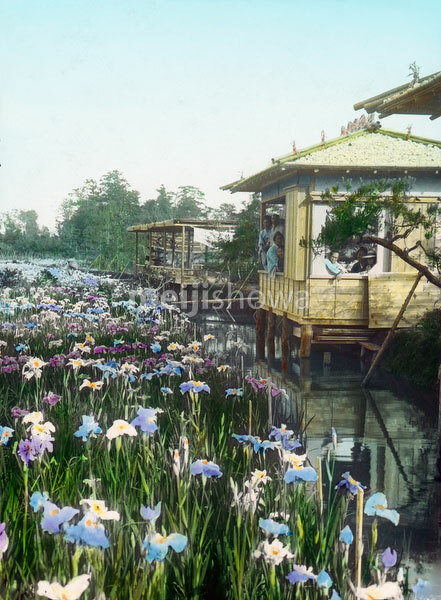 The garden remained extremely popular until it was closed in 1921 (Taisho 10).